Installation view of YMoCA (Yatai Museum of Contemporary Art), Iwaki, Japan, 2014. Photo by Wen-You Cai, courtesy Cai Studio. 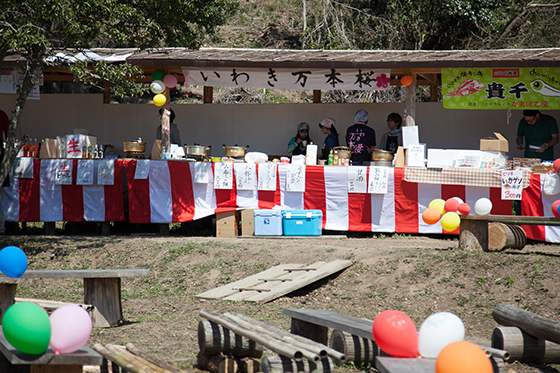 Residents from Iwaki set up multiple yatai—or small, mobile food stands that prepare and sell small dishes—creating small dishes using local produce that were safe to consume. The gesture was meant to dispel any rumors that local seafood and agricultural products may be contaminated by nuclear radiation. 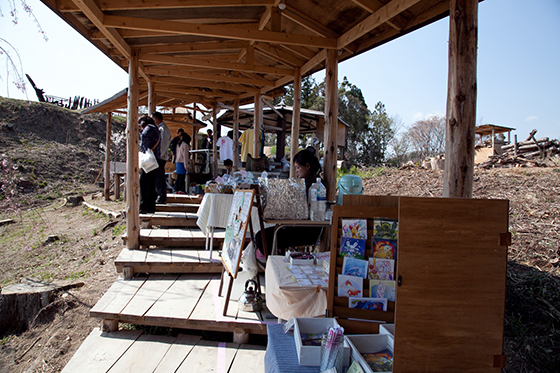 Local residents also made handicrafts, which were for sale at the museum, transforming the site into a flea market. In addition, children’s drawings and sculptures were also on display at SMoCA. 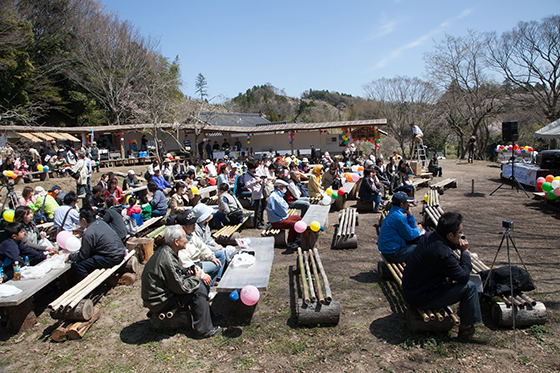 Installation view of food stands at YMoCA (Yatai Museum of Contemporary Art), Iwaki, Japan, 2014. Photo by Wen-You Cai, courtesy Cai Studio. 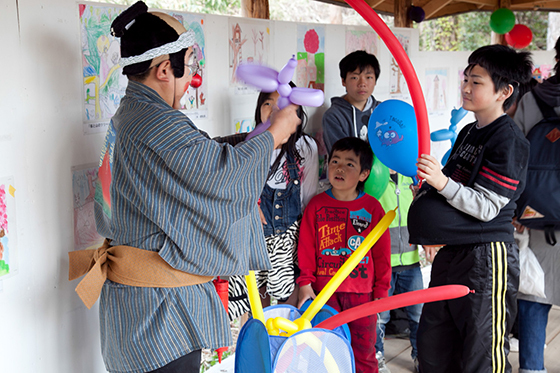 Clown making balloon animals as part of YMoCA (Yatai Museum of Contemporary Art), Iwaki, Japan, 2014. Photo by Wen-You Cai, courtesy Cai Studio. Invited by artist Cai Guo-Qiang, Sebastian Masuda, one of the pioneers of Harajuku street culture in Tokyo, along with the band Nikoman brought a wave of Harajuku kawaii (“cute”) culture for the people and children in Iwaki village. With assistance from the Iwaki Board, Sebastian Masuda organized a children’s workshop Let’s Make Some Kawaii Lanterns! with a local elementary school. 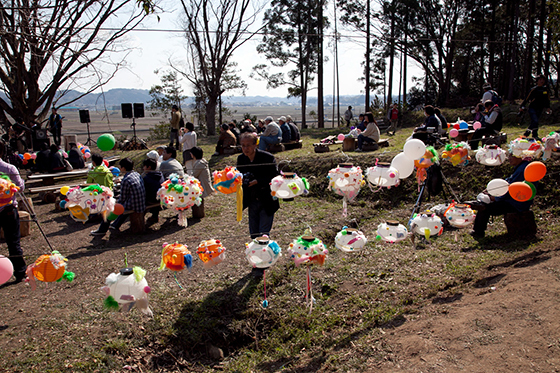 Children were invited to design and make their own lanterns using kawaii, or “cute” materials, such as brightly colored soft toys, balls, and beads brought by Masuda. After the workshop, the children brought their works to SMoCA, and decorated the structure with their creations. 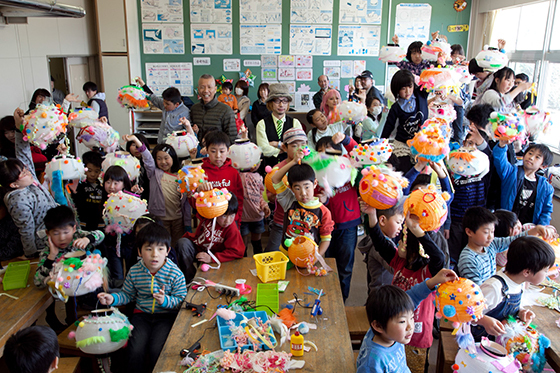 Students with lanterns they constructed in Sebastian Masuda’s Let’s Make Some Kawaii Lanterns, Iwaki, Japan, 2014. Photo by Wen-You Cai, courtesy Cai Studio. Installation view of lanterns created by students at YMoCA (Yatai Museum of Contemporary Art), Iwaki, Japan, 2014. Photo by Wen-You Cai, courtesy Cai Studio. 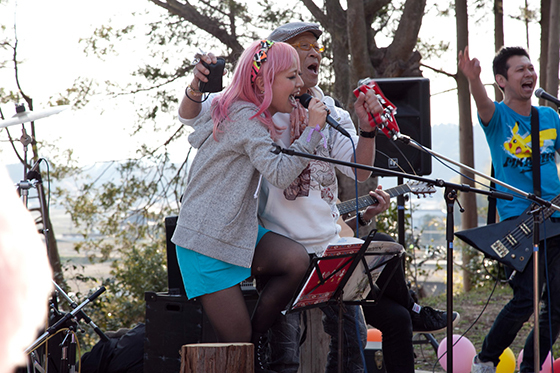 Neeko and Iwaki resident performing together during Nikoman Show, Iwaki, Japan, 2014. Photo by Wen-You Cai, courtesy Cai Studio. Ⅲ. Over a period of time, volunteers in Iwaki worked hard to extend SMoCA from 99 meters to 150 meters, linking the museum with Kaikou—The Keel (Returning Light—The Dragon Bone), a large-scale outdoor installation permanently installed on the hilltop of Tateyama, which has become a new local landmark. 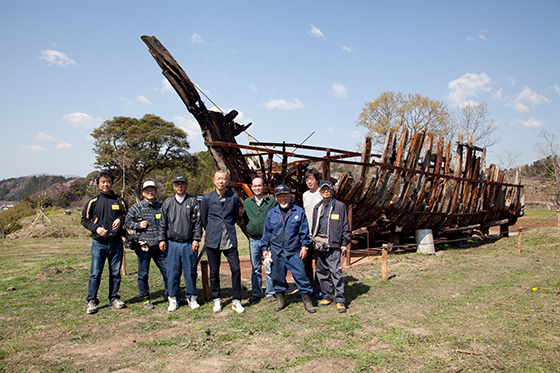 Cai Guo-Qiang and Iwaki Team standing in front of Kaikou—The Keel (Returning Light—The Dragon Bone), Iwaki, Japan, 2014. Photo by Wen-You Cai, courtesy Cai Studio. In August 2012, the Iwaki team traveled to Copenhagen, Denmark, to assist with the installation of Reflection—A Gift from Iwaki during Cai’s solo exhibition, A Clan of Boats, at the Faurschou Foundation. With generous support and advocacy from the Foundation, the Project to Plant Ten Thousand Cherry Blossom Trees was able to move forward, and the funds raised enabled cherry trees to be planted on an entire mountain. In October of the same year, Cai was honored at the 24th Praemium Imperiale with a Lifetime Achievement award in the Arts (Painting). He decided at once to donate his award earnings—15 million yen in total (approx. US$150,000). Half was given to the Asian Cultural Council to sponsor young Japanese artists to pursue advanced studies in New York, and the other half was used to realize SMoCA and to complete the cherry blossom project. Co-founded by Cai Studio and the Iwaki Board for the Project to Plant Ten Thousand Cherry Blossom Trees, the Snake Museum of Contemporary Art (SMoCA) opened with an inaugural exhibition in 2013. As part of artist Cai Guo-Qiang’s conceptual series Everything is Museum, SMoCA subverts the definition of a traditional art museum. The artist initiated a community effort for the realization of SMoCA, and local residents and volunteers helped build a 99-meter long winding corridor with trees contaminated by radiation from the 11 March 2011 Great East Japan earthquake and Fukushima Daiichi nuclear disaster. Meandering quietly across the mountains, the “museum” winds through the land on which 10,000 future cherry trees will be planted. The artist hopes the museum will become a space where the residents of Iwaki can bond with their children and let their dreams fly free.